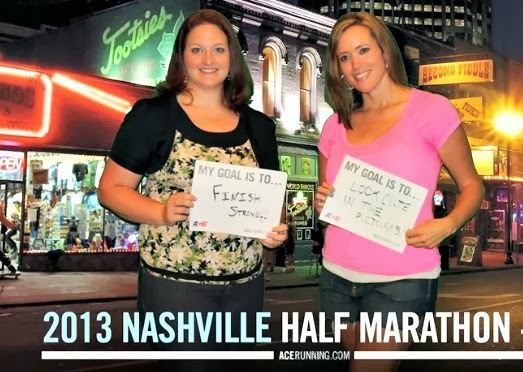 This was my 2nd year running the Nashville Women's Half. It was my very first half last year, this is where I became addicted to running! The goody bag was nice, but as always, the tech shirt was WAY too small. I ordered a L, but it was the size of a small. That was the main complaint of everyone. After that we went to the 'world famous' Wildhorse Saloon. When we first walked in , it was all older people. We laughed about it, but decided to stay. After awhile it started to fill up with people our age though! We walked around downtown for a bit before heading back to the hotel so we could get some sleep. 5 a.m. came very early! I had made plans to meet up with another blogger and a facebook friend who were also running. I was so excited about meeting them! Jen blogs at Dare, Run, Share and is SUCH an inspiration. She started running a couple years ago, and set a goal to run a half marathon before she turned 40. She lost 50 lbs., and ran her first half last year. This coming up weekend she's running Disney's Tower of Terror 10 miler. She's amazing! I also got to meet Jenny at Running 4 me. She's also an inspirational lady who has lost 35 lbs., been able to go off her blood pressure pills, and has changed her life through running! She's a super fast runner and got a 13 minute PR at this half!! Totally awesome!! My only goal was to beat my time from last year. I was secretly hoping for a 2:20, but for some reason I doubted that would happen. Maybe if it was a flat course, I would've been more hopeful. I had forgotten how hilly it was though. It seemed like constant hills! But it was a pretty course. I love Nashville! I took my first GU at mile 5 and then again at mile 10. There were a lot of water/gatorade stops, which was very nice. I really felt great throughout the race. Around miles 11 and 12 I had to remind myself that I ran 20 last weekend, so I can do this!! But like I said, THOSE HILLS! The crowd support was wonderful. It seems like there were people all along the course cheering us on and little kiddos giving high fives. We even ran passed a house that had a bluegrass band playing on their front porch. That was so cool!! My finish time was 2:38. Which is 4 minutes faster than last year. I should've done a lot better, but it is what it is, and I'm learning not to be disappointed with my times! Julie did SO good too. This was her first half and her goal was to finish in under 3 hours, and she did it! I don't remember what I was laughing at, and I honestly don't like this picture- but it perfectly describes my weekend. Happy and fun! How was your weekend? Did you run or race? That medal is so cool! Congrats on beating your time from last year! I never know what size shirt to order in women's sizing! It seems like there is such a variance! I have a lot of shirts I can't wear (not that I would, anyway, lol). Thanks Kim! I know, women's shirts are ALWAYS different, it's kind of annoying! If it's a tech shirt, I'll wear it again! Congrats to you too! Can't wait to read your recap! Yeah, I promise coyote ugly was way more fun the last couple of times I went.....it was NOT that night. It was a fun weekend though! I'm sure it was. It was an awesome weekend! LOVE THAT MEDAL! And congratulations on beating your time last year! I had a half this weekend with a rough hill and missed a PR,- I feel your pain! Thanks girl! You still did awesome at your half!! Sounds like you had a great race and looks like you had a good time! Congratulations on beating last year's time! Looking forward to meeting you in Chicago in a couple weeks! What a beautiful medal! Looks like such a fun race and a good time! Way to go girl!!! Thanks Kristy! It was a lot of fun! I love your race recaps! Sounds like you had such a wonderful time and how special to meet so many other bloggers :) I love the last pic of you....you look so happy! Thanks girlie! Someday I'm coming to FL to run with you!! Thanks Teresa! It was really nice meeting other bloggers! Thanks Rachel! Congrats on your 20!! I am feeling really good about it. I'm nervous, but very excited!! I love the Cowboy boots medal. It may be the cutest one I have ever seen. Yep, I'd have to agree with ya!! Congrats on your improvement from last year! It sounds like you guys had a really fun night on Friday too! Great pics! Thanks Jen! So glad I got to meet you! Thanks Phaedra! I'm trying to look at it that way. It was an awesome weekend! What a fun weekend! And cool medal :) I'm glad you're not beating yourself up about the time on the clock because the most important thing (which I am just re-learning) is to have FUN! And you accomplished that! I ran a marathon on Sunday and it wasn't a PR but probably my best race so far. It is hard not to be SO focused on my time. But having fun is important too! You ran another marathon?? You're amazing girl! It is YOU who actually planted the thought of running in my head. I am still struggling--but hoping I'l get there. Congrats on your first 10k, Tanvee!! That's so swesome! I think you can totally do a half! Thanks girl! I love the medal for this year's race and I wish I'd been able to work this race into my schedule this year. Congratulations on a great race and I'm glad you had such a fun time. That's always the most important thing, in my opinion! Thank you Suz! I really hope we can do it together next year!! Last long run before Chicago!! Greecie Girl Headband Review and Giveaway! Anniversary, birthday, oh, and a 20 mile run!